Modern HR people are trained to look for special qualities when they are hiring at the manager level and above. 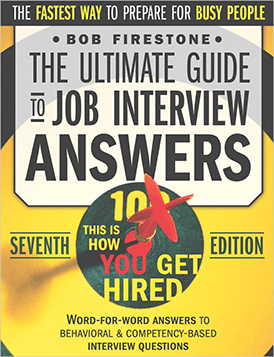 You'll give better answers in your interview if you understand the psychology behind their questions. Here's what you need to be thinking about. Before we take a look at specific interview questions, let’s look at some of the “core” competencies expected of most employees and supervisors — and we’ll compare those with how managers and executives are supposed to show more “advanced” competencies and proficiency in these areas. Gives and receives timely feedback on personal work performance in accordance with established goals. Solicits and enables communication and feedback from a variety of sources (including customers) — up, down and all across the business organization. Understands that careful listening and clear communication is essential. Is able to communicate difficult messages and sway the opinions of other stakeholders, managers and executives. Knows how to modify communication style for different audiences. Makes sure written documents and emails are professional and accurate. Creates and enforces clear guidelines for department writing standards. Coaches & mentors others on the best way to communicate information. Develops newer, better, faster or cheaper ways of getting things done. Establishes a welcoming environment for new ideas, and creates excitement for the benefits of making positive changes. Encourages collaboration and partnerships across the organization. Establishes good priorities for what to do next. Asks effective investigative questions and identifies and prioritizes key next-steps for others. Is able to make tough decisions with scarce information under rigid deadlines. Can you see the difference between the two columns? The expectation for managers and executives is that they think more about the organization, and other people. Employees and supervisors are mostly concerned with their own work — or the work of their team as it relates to more immediate goals. Managers / execs innovate, facilitate, and try to create an environment that develops and supports company goals and policies on a longer-term, more “global” scale. These are the qualities they’ll be looking for in your management interview, at least. So, what does this mean for you if you're interviewing for a management position? It means you have to be prepared to speak to “creating an environment” for ABC and “encouraging adoption” of XYZ and trying to “establish a culture” of 123. HR people love hearing answers like this; and they’ll be looking for them in candidates for management level positions. Read the following questions and think about how you might answer based on the example behavioral competencies in the right-hand (management) column above. "Tell me about a time when your team had to work together to solve a crisis situation. What happened and what did you do?" "Describe some of the methods you've used to keep a team inspired to accomplish tasks on time and with high-attention to maintaining quality every step of the way." "Do you use any time management systems or programs? For example, Franklin Covey, Inbox Zero, GTD, Google Docs, Salesforce.com, Outlook Calendar or other tools? … How have you used these tools collaboratively? Do you have ideas for better collaboration among team members and across departments?" In answering the first sample question above, remember that your answer should go into just enough detail to set up the background for the “crisis” and then you should focus on your analytical approach to identifying the problem and prioritizing the next steps for a solution WITH YOUR TEAM — by getting consensus, if appropriate, or by making a critical “executive” decision on your own when you had limited information. What type of probing questions did you use to gather information? How did you communicate the action plan to your team? … How did you communicate the status and resolution of the crisis to executives above you and other managers or execs across the organization? And importantly, what kind of procedures or culture or environment did you create or encourage at the organizational level to stop such a crisis from happening again? Management interview questions are designed to expose organizational-level thinking beyond your team or your department. … that gets team members to take responsibility for the quality of their work." … that holds myself personally accountable for all deadlines, and the team knows this." "Served as a role model"
… for treating every person with respect and taking responsibility delivering work at our established professional standards." … for coming up with new ideas and encouraging others to do the same." "I set an example and implemented standards"
... for proper budgeting of time so that deadlines are met." ... for meeting our commitments to internal and external customers and stakeholders." When you talk about tools and collaboration, don’t focus too much on the tools. Focus on the results the tools allow you to achieve for you and the goals and growth of the team. If you can investigate and discover which internal tools the company uses BEFORE your interview, and you can show some familiarity with their tools, then you are ahead of the game! The people (HR and the Hiring Manager) who use these tools on a daily basis will be pleased that you already understand the screens they look every day. It's a big part of their work life, and they may be more inclined to view you favorably as a candidate if you can identify with them over a shared toolset. — As a person interviewing for a manager or executive position, understand that when you are asked situational questions, the examples you give should be related to teamwork, leadership, communication, “creating an environment / culture,” and developing & championing best practices for the organization broadly. — For each of the 5 examples in the “manager / executive” column in the table above, write down your own similar example from your personal work experience. — Practice some of the “lead-in phrases “ like “I set an example for,” “I fostered an environment where,” “I contributed to creating a culture of …” etc.